Amazon Redshift is an extremely scaleable data warehouse based on PostgreSQL. The data contained in the JSON files is also loaded into an Amazon Redshift database that can be queried with SQL syntax, directly over the internet or linked to any number of data analysis tools such as Tableau, redash.io, chartio, Microsoft Power BI, and more for custom analysis. Tableau is perhaps the easiest to get started with. While Amazon Redshift contains the data already available in the JSON files discussed here, storing, indexing, and making this data available via Redshift does carry a non-trivial financial cost to ADSBexchange. Access to our Redshift database is available for a fee. If you have a personal, non-profit, or commercial use in mind, please contact us for more information on getting access. Click here for a partial description of some of the fields available to query. There are nearly 3 billion records and counting. 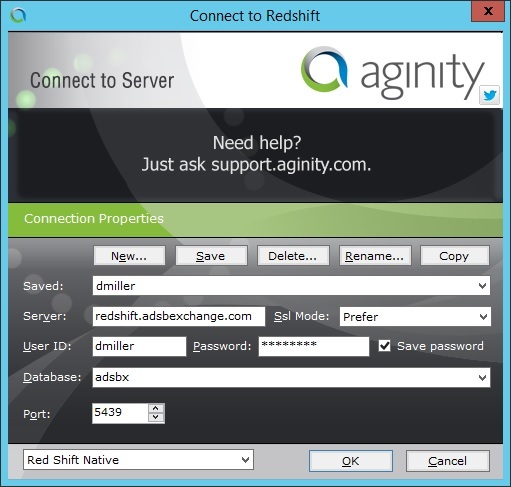 Your login to Redshift will consist of a username and password. As mentioned above, there are many data analysis tools that can connect to Redshift. To issue basic SQL queries and explore the schema, Aginity Redshift Workbench is an excellent free tool. If you are using Aginity Redshift, below is an example of how to configure a connection (assuming your username is, for example “dmiller”). 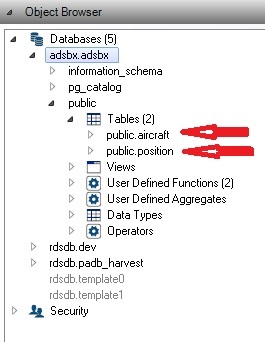 Once you connect to the database, the tables with the data are public.position and public.aircraft.